"Chinamma (Sasikala) is responsible for AIADMK remaining in power..there is no second opinion about it," he told reporters in Madurai. Madurai/Chennai: Stirring a hornet's nest in the ruling AIADMK, Tamil Nadu Minister Sellur K Raju today praised deposed party chief VK Sasikala saying she had played a key role in ensuring continuance of the party government. Mr Raju made the comments at a time when Ms Sasikala, serving a four-year term in a Bengaluru prison in a disproportionate assets case, has obtained five-day emergency parole and is staying in Chennai in view of the hospitalisation of her husband Mr M Natarajan, who had undergone liver and kidney transplants. The minister's remarks are expected to cause a ripple in the ruling camp which had last month removed Ms Sasikala and her clan, including her deputy TTV Dhinakaran, from the party. A senior party leader from southern Tamil Nadu, Mr Raju was apparently referring to Ms Sasikala guiding the party after the demise of late Chief Minister Jayalalithaa in December last year. Mr Raju had last month contradicted the claims of two of his cabinet colleagues that no one was allowed to see Ms Jayalalithaa during her hospitalisation last year. After senior leader O Panneerselvam revolted against her leadership and her conviction in the DA case in February last, Ms Sasikala had kept her flock together in a resort near here and ensured election of Mr Palaniswami as the AIADMK legislature party leader. However, the camps led by Mr Palaniswami and Mr Panneerselvam later merged and convened a General Council meeting last month which sacked Ms Sasikala as the interim general secretary. Mr Raju said since he was a minister he had to be restrained in his comments. His views should not affect the steps being taken by Mr Palaniswami and Mr Panneerselvam at the helm of the government and the party, he said. On the dengue situation in the state, the cooperation minister said the present government was taking rapid action to control the spread of the fever cases. The minister's comment hailing Ms Sasikala had been greeted with enthusiasm in her camp. Ms Sasikala and Dhinakaran loyalist Ms CR Saraswathi lauded Mr Raju for his remarks endorsing the jailed leader's role and dramatically claimed that, "the sleeper cells there are coming out one by one." "Sleeper cell," is a phrase often used by Mr Dhinakaran, who has been seeking to oust Mr Palaniswami from power, in the recent past to claim that he had supporters in the ruling camp and they would rally behind him at the right time. 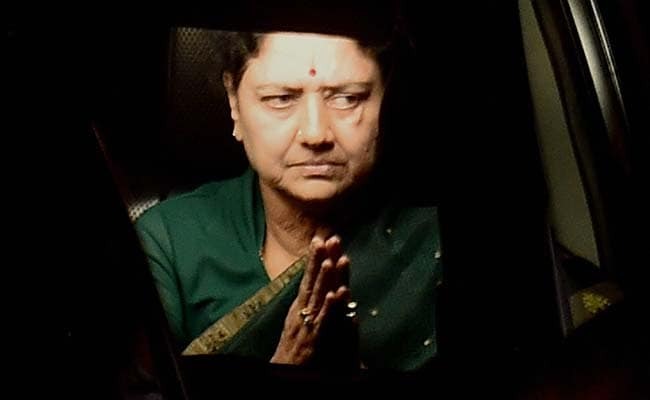 Ms Saraswathi, a yesteryear actress and party spokesperson, asked how "their" conscience was not pricking them after seeing "Chinnamma" on television going to hospital, an apparent reference to those in the Palaniswami camp. Naturally those in the rival camp will be seized of the "thought that the government was put in place by Chinamma," she told reporters in Chennai. Only Ms Sasikala and Mr Dhinakaran will be able to steer the party and cadres were clear about that, she claimed. Meanwhile, Ms Sasikala, who arrived in Chennai on October 6, visited her husband for the second day at the Gleneagles Global Health City Hospital around noon today. She was greeted by scores of party men in several locations as she travelled by a car to the hospital. Ms Sasikala was apprised on the health condition of Mr Natarajan by doctors at the hospital. She spent a little over two hours there, sources said. She had been granted parole with tough conditions, including one that said she should not be involved in political or any other public activity or take part in party activities.